I won a door prize! It was a DNA test kit from MyHeritage DNA, which I received while attending the Association of Professional Genealogists conference in Kansas City last month. It was funny because all four of the men at the conference named Steven won door prizes! That was the lucky name that day, I guess. So I swabbed my cheeks and sent in the samples. The results came back this week. Ethnicity Estimate: Check out the pie chart below. 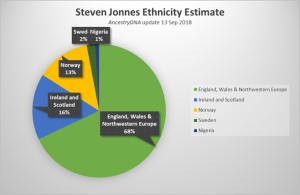 I’m placing it alongside the previous ethnicity estimate received from AncestryDNA in September. The two estimates are actually not too far apart. Scandinavian is exactly the same at 15%. In addition, the third company I have results from, FamilyTreeDNA, has Scandinavian at 10%. Although we have to be careful with ethnicity estimates, this is 3 separate testing companies that are giving me a percentage less than the 25% my relationship with my Norwegian grandfather would genealogically indicate. So possibly I received less Norwegian DNA than my brother and sisters. If true, I am surprised because I always thought that I inherited a lot from my maternal grandfather. I remember Grandma Bonn once turning to me in the dining room at the yellow house over Christmas one year when I was a teenager, and exclaiming, “Why, you sound just like Bert when you talk like that!” There had been a heated political argument at the dinner table during which I was quiet, but after the debaters left the table, my Mom and Grandma and I were left, and I started to analyze the different sides of the argument in a calmer manner than had been going on. Of course this has nothing to do with DNA, but it’s a good example of the kind of personal memory which can color people’s perception of what they have inherited. The British portions are also not that far off. MyHeritage DNA says 70% for English, while AncestryDNA says 68% for England, Wales & NW Europe. 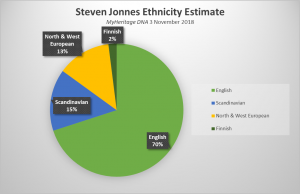 If we add the 13% for West & Northern Europe to my 70% English from MyHeritage DNA, that totals 83% – as a rough comparison to AncestryDNA‘s 68%. In FamilyTreeDNA, the comparable result would be 77% (when you combine British Isles with West & Central Europe). However you slice it, I have a heap of British and NW European ancestry. What’s surprising in the new MyHeritage DNA estimate is the absence of Irish, Scottish or Welsh. There is such a category, but I am listed at zero percent! This contrasts with the 16% in AncestryDNA. I can only surmise that the reference populations and logarithms used by the two companies are so different that what we would think of popularly as “Celtic” ethnicity is defined or captured quite differently. Although AncestryDNA assigned 1% to Nigeria, MyHeritage DNA shows no African heritage. In comparing our trees, I discovered it is a Lukemire second cousin. We have the same great grandfather, Wilber Lukemire (1868-1946) and the match has a parent who was a first cousin to my father. I will try to reach out to him and make it official. The second top match is quite a bit less at 69 cM with the longest segment at 40 cM. This would indicate a relationship at the 3rd or 4th cousin level. It appears to be a Blalock cousin of some sort, based on a shared match with a third person. It’s hard to tell because the match himself does not have a tree on MyHeritageDNA – so again I will need to reach out. 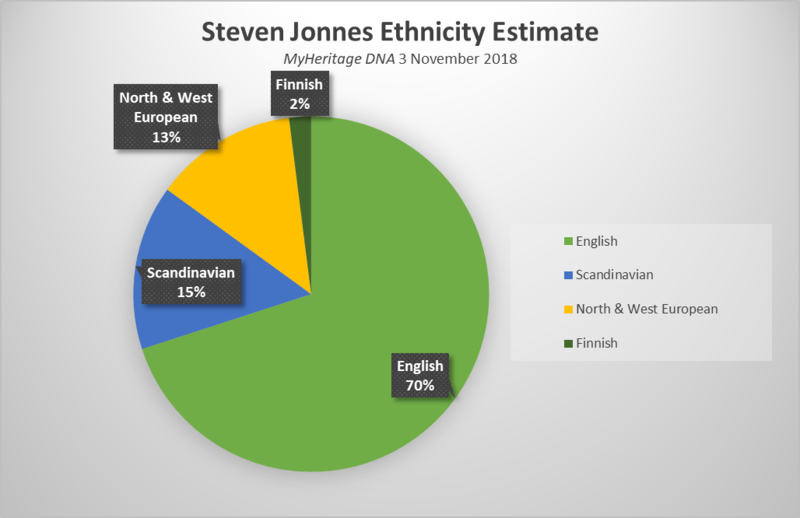 Review: As far as ethnicity estimates go, I think I prefer AncestryDNA over MyHeritage DNA, although both definitely seem far better than FamilyTreeDNA in this regard. Of course, without knowing the truth of my ethnicity, it’s hard to provide firm judgments about which company is more accurate. In terms of cousin matching and genealogical usefulness, I prefer FamilyTreeDNA because of its robust chromosome browser and its ability to provide cousin matching with Y-DNA and mtDNA. It is the only testing company that offers this combination of features. Unlike AncestryDNA or 23andMe, MyHeritage DNA does have a chromosome browser for autosomal DNA and the interface is very good. Also, MyHeritage DNA is one of the few testing companies – along with FamilyTreeDNA – that allows you to build a family tree and link DNA results. This is probably the primary strength of MyHeritage DNA. It only began offering DNA testing in 2016, but has been in business since 2003 as a family tree/genealogy research platform – a competitor to Ancestry.com. 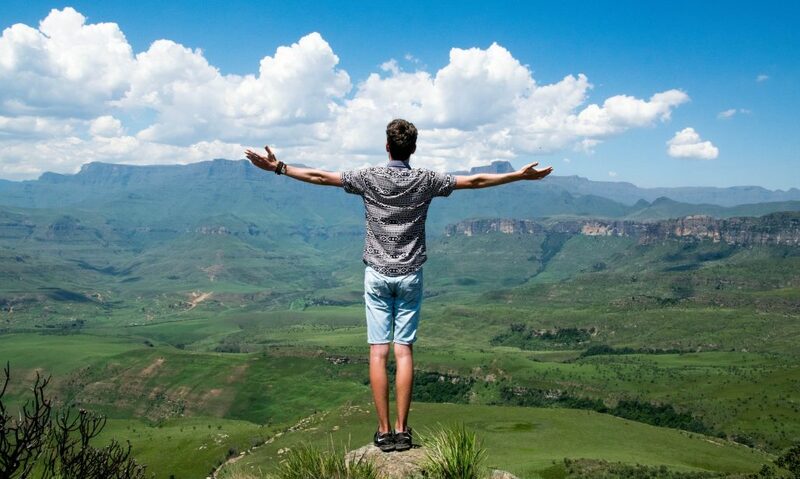 Another strength of MyHeritage is that is has more international customers, so you have a better chance of finding matches with people overseas, especially in Europe.